E-beam (electron beam) evaporation is a thermal evaporation process, and, along with with sputtering, is one of the two most common types of physical vapor deposition (PVD). E-beam evaporation provides for the direct transfer of a larger amount of energy into the source material, enabling the evaporation of metal and dielectric materials with very high melting temperatures, such as gold and silicon dioxide, respectively. Therefore, it is possible to deposit materials that cannot be evaporated with standard resistive thermal evaporation. An additional benefit of e-beam evaporation is higher deposition rates than possible with either sputtering or resistive evaporation. In e-beam evaporation, the evaporation material can be placed directly in a water-cooled copper hearth or into a crucible and heated by a focused electron beam. The heat from the electron beam vaporizes the material, which then deposits on the substrate to form the required thin film. E-beam evaporation is used to deposit a wide variety of materials. Commonly used for such optical thin film applications as laser optics and solar panels to eyeglasses and architectural glass, e-beam evaporation provides the optical, electrical, and mechanical qualities required. E-beam evaporation provides a high material utilization efficiency compared to other PVD processes, reducing costs. Denton Vacuum’s e-beam evaporation systems are delivered with programmable sweep controllers to provide optimal heating of the evaporation materials and minimized contamination from a crucible. Multi-pocket e-beam sources can be provided to sequentially evaporate different evaporation materials without breaking vacuum for multi-layer film designs. 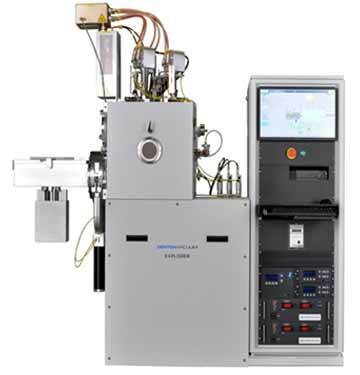 Systems are configured with thin film deposition controllers for automated single and multiple-layer process control. 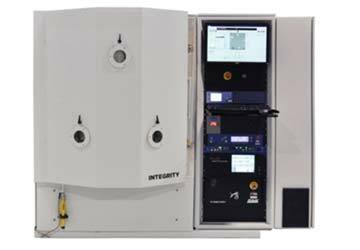 Real-time optical monitoring and control hardware and software can be fully integrated into a system to allow for automated process control for critical optical coating applications. E-beam evaporation is controllable, repeatable and compatible with the use of an ion assist source to enhance the desired thin film performance characteristics. Denton has developed two systems for e-beam evaporation applications, one offering a versatile configuration for R&D and pilot production, the other targeting high-volume production with application-specific configurations. We have over 50 years of experience in delivering turn-key process solutions for metallization, lift-off, and precision optical coatings. The e-beam solutions below provide many options to meet your application’s requirements.